The risks to your health by not dealing with dust properly are not worth thinking about, so I am always interested in testing anything to do with its extraction. Budget and space also come into the equation when considering workshop systems, and while the larger workshop will probably have static extractors connected to the machinery via ducting, the smaller shop may not be able to enjoy this luxury. 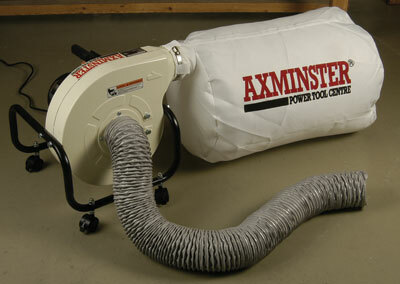 Axminster have many extraction units to suit all sizes of workshop and it was two smaller units that caught my eye: the Perform CCDE500 and the Axminster ADE600 dust extractor. Both look similar, indeed some of my friends have affectionately nicknamed them 'snails', but the yellow Perform CCDE500 is for hobby use and the white ADE600 unit is for trade use. The unit comes partly assembled, with the user needing to fit the handle, wheels and the hose, which is not supplied with the unit so has to be bought separately. All of this was self-evident. The wheels are attached via a bolt arrangement into the baseplate, the bag is fitted via a jubilee clip onto the venting port found on the side of the main body, and the 100mm- (4in) diameter hose is fitted to the extractor port with another jubilee clip. When affixing the hose on this unit I noticed that there were crosshair sections in both the intake and exhaust ports. This is to comply with current legislation aimed at preventing people from sticking their fingers/hand into the body of the unit and coming into contact with the internal fan blades. It is interesting to note that both extractors can be used in one of two ways. One way involves fixing the wheels to the base and using it as a mobile extractor, connecting it up to machinery as necessary or behind the lathe so it collects the dust during turning. Alternatively, rather than affixing the wheels, instead bolt the unit to the wall so that the bag hangs down; via ducting or longer lengths of hose, connect it to the machinery. I had the wheels on. My workshop wall space is at a premium and by having it mobile I could tuck it away in a corner when not in use. I moved the unit and connected it to the bandsaw, then cut 10 blanks ready for turning along with some veneer strips for use on a coffee table. On starting up there was a 'whoosh' from the extractor as the bag inflated, but the running noise from the motor was quiet - a pleasant change from the usual screaming banchee wail. The unit coped well with the dust generated during cutting. 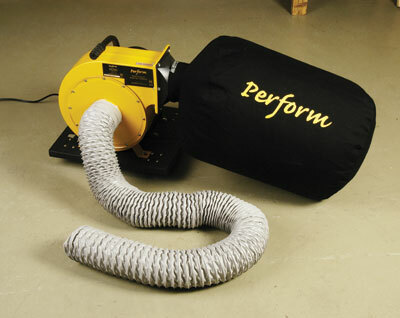 I also used it behind the lathe to collect fine dust when sanding and during the turning process. The unit coped with the dust well, but would have done even better with a hopper head arrangement fitted to the hose sited behind the lathe. You can buy these or make your own. The one area that the unit did not cope well with was shavings from the lathe or when using it to clean the floor. The shavings became caught in the crosshair sections very quickly and jammed up, preventing the unit from working properly. The hose had to be disconnected and the jam cleared manually - a crying shame for this is a good unit. It would serve the hobbyist well for fine dust removal, but would be equally as good for shaving removal were it not for those crosshairs which no doubt have come about because of legislation requirements and to avoid potential litigation. The preventative measure taken to stop some dimwit from sticking fingers in places they should not has marred a great, nicely priced product. At Â£108.06 - including the hose - the Perform CCDE500 is an excellent machine for dealing with dust, but you may experience clogging with the cross members in place. This machine is similar to the Perform CCDE500, but is bigger. The bag has a large capacity, there is a cradle instead of a soleplate and the hose comes as standard. This unit also comes part assembled, just requiring the fitting of the wheels - if you want to use them - the removable crosshair sections, the bag and the hose. At Â£169.95 this unit is somewhat dearer than the previous model but the finish is better. It is heavier and the motor is rated for trade use, so should put up with some serious rough and tumble. If you are a serious hobbyist or professional rather than an occasional user this should be the machine to go for. Having experienced the problems with shavings and crosshairs on the previous model, I elected to leave these off when testing this machine. I did of course tell myself not to stick my fingers into the ports and into the spinning bits inside. I must say that without these in place the unit performed like a dream. There was no clogging and it coped with clearing up the floor as well as dust and shavings from machinery. I know I should not do it, or advocate such a stance, but I liked the fact that the unit worked wonderfully without those bits in place. This is a very good extractor. If you work in a small workshop it will not take up a lot of space, the noise is low when compared to other units and it is not too expensive. What more could you ask for? "The risks to your health by not dealing with dust properly are not worth thinking about"